Some marathons are big and some marathons are small, and one in particular sounds like the worst race ever run. 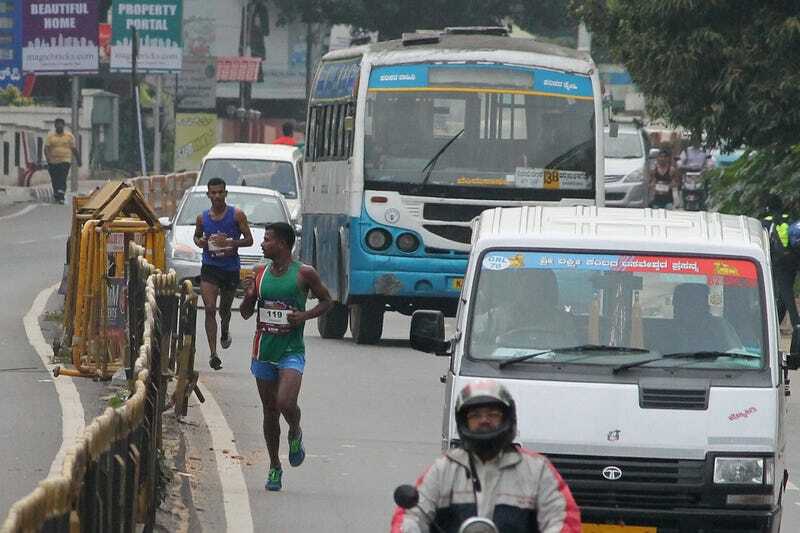 The pace car of the Bangalore Half Marathon missed a U-turn at the 16-kilometer mark, leading the race's top runners with it. The top three, who gradually realized something was wrong after the crowd had disappeared, were four kilometers off-course when the vehicle finally alerted them to the detour. But that was about all the help they were going to get. "We borrowed 30 rupees from a few morning joggers to take a metro train to reach the station closest to the finishing line," one of the runners told The Wall Street Journal India. Marathon organizers blamed the detour on a media vehicle at the head of the race missing a turn. That would be fine if it was the only incident. It wasn't. Another woman in the full marathon ran over three miles in the wrong direction before organizers were able to steer her back on course, and others runners said the only way avoided a similar fate was by following TV crews. Drivers, tired of the road closures, drove through barriers, filling a part of the course with honking cars, witnesses said. In one pile up the number of cars outnumbered traffic cops and drivers were heckling the runners, witnesses said. Don't run marathons in India.